To the digital audience, mostly educated, I had written a piece in CNS Kashmir, calling for contemplation and the revision of views. But within a span of 6 hours, Indian state in an utter frustration decided to blackout the links and brought them down. It was not the civil administration that threatened the press and the people, but it was the military set up that was upset and shaken. The fact is that our occupier lacks the spine to bear our word, leave the bullet. Even our words shiver ‘the world’s largest democracy’. Those who are developing an antithesis for the weapon wielder using the ink, let the genesis of my new role be known to them and all. I am writing this piece for the special audience, a different one than earlier. Remember, I was born in the hills and I am back to them again. Meanwhile, I have realised my mode of resistance. From my birth, I have been surrounded by the military boots, and even my school functions were held at army camps. My elementary studies too have a military base. I was taught at Jawahar Navodiya Vidaliya – the educational extension of the Indian occupation in Kashmir. By then, my imagery of India was a fantasy, and my aspirations were similar to a true Indian. I graduated from a College in Srinagar and engaged in understanding the discourses and identified the difference of being. After seven decades, Muslims in Jammu and Kashmir are struggling hard to protect “semblance” of their unique culture and identity that was “guaranteed” to them under Articles 370 and 35-A by the givers of the Indian Constitution. For 70 years, Article 370 has served Delhi’s interests beyond its expectations, internally as well as externally, keeping in view geo-political challenges it faced. It was this Article that rescued India by advancing on it an argument of “legal relationship” with the State. Article 35-A is an offshoot of Article 370. With legal pratfalls to final burial of the remnant “empty shell” of Article 370 for it’s inbuilt “irremovability clause” in it, the challengers of these provisions changed the direction of their “legal tirade” straight against Article 35-A. They know by its removal, their “ultimate agenda” of changing Muslim majority character of Jammu and Kashmir will automatically be fulfilled. God forbid, if it happens, it will be a bigger deathblow to Muslims in the state than genocide of Jammu Muslims of 1947 with devastating consequences. The Government and Opposition of Jammu and Kashmir have united against the possible retracting of Article 35A which gives the state special rights and privileges. At a recent event in Delhi, state CM Mehbooba Mufti said if Article 35A was tinkered with, there will be no one in Kashmir to uphold the national flag. Main Opposition party National Conference chief Farooq Abdullah warned that if the Centre does any tinkering with the existing arrangement concerning Jammu and Kashmir, there would be a huge protest, much bigger than what was seen during the Amarnath Shrine land controversy when his son Omar Abdullah was the Chief Minister of the state. 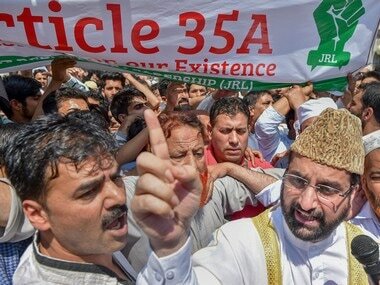 Article 35A of the Indian Constitution is an article that empowers the Jammu and Kashmir state's legislature to define “permanent residents” of the state and provide special rights and privileges to those permanent residents. The article draws its relevance and affects effectiveness of Article 370. It is a Constitutional provision applied by President of India to the State of Jammu and Kashmir and has no application to any other State. Before 1947, the State of Jammu & Kashmir was headed by a ruler. He was competent to make laws for his subjects. These laws included laws relating to employment, acquisition of property, settlement in the state etc. All other persons who were not residents of the State or subjects of the ruler were treated as foreigners. The ruler defined State Subjects by law and also conferred rights and privileges on his subjects.